With this Framed Office Supply Holder, you'll never lose your scissors or pens again. This DIY organizer keeps your supplies safe and out of reach of children, but also adds a cute, whimsical touch to your DIY home decor. The framed pouch is hung on the wall, so your pens, scissors, paper clips, and other supplies are always within eyesight. You can personalize it with different materials, colors, and designs that match your office or sewing room. Plus, this easy sewing project uses fabric scraps, which makes it affordable and practical. Wow this is a real neat way to keep your supplies where you know where they are. 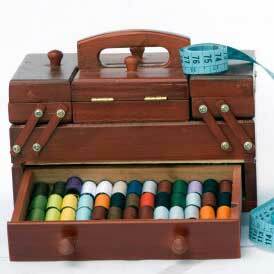 I can see this in a sewing room,in an office or even a kids room. My grandkids are always losing the scissors, their pencils,crayons and you can even sew the size pockets you need. You can find cheap frames anywhere or one you have laying around and scrap pieces of fabric laying around. I really like this idea. Great project.